An excellent 1855 first edition example of Colton's map of Missouri. Like most of Colton's state maps, this map was derived from an earlier wall map of North America produced by Colton and D. Griffing Johnson. Covers the entire state of Missouri as well as adjacent parts of Illinois and Kansas. An inset of St. Louis and the juncture of the Mississippi and Missouri rivers appear in the upper right quadrant. The map also delineates survey grids and plats referencing the work of the U.S. Land Survey. Across the border, in Kansas, numerous American Indian tribes are noted including the Cherokees, Osages, Sacs and Foxes, Ottowas, Shawnees, the Delaware Reserve. In the upper left hand corner of the map, in territorial Nebraska, an area is identified as the home of 'Half Breeds.' This refers to lands claimed by descendants of early setters to the region who intermarried with the Sacs and Fox tribe. Though not technically considered Indians, their claims to the lands were based upon earlier Indian claims and were later disputed by the regional government. This map was issued at the height of the American westward expansion. Six years before this map was drawn the California gold discovery of 1849 enticed thousands to embark upon the rigorous transcontinental emigration. Meanwhile, with the rise in territorial population to the west of the Mississippi, the eastern states were becoming increasingly divided over the issues of slavery and state vs. federal sovereignty. Within five years these disputes would lead to the American Civil War. 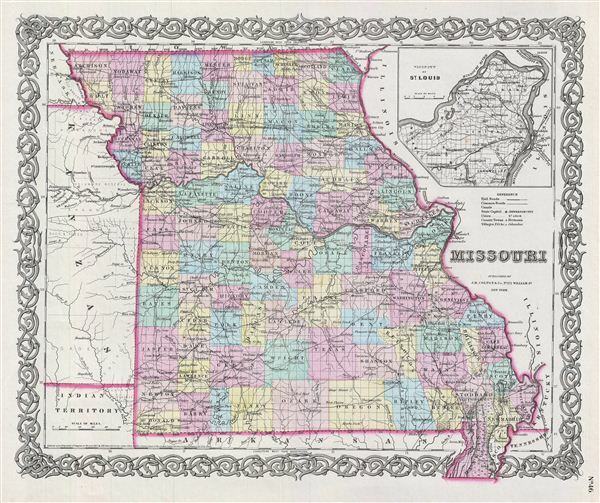 Missouri played a pivotal role in the events leading up to the Civil War. The Missouri Compromise which allowed Missouri to become a slave state, stipulated that no future state north of Missouri's southern border could enter the Union as a slave state. Though the Compromise briefly alleviated north-south tensions, it would only last until the 1854 the Kansas-Nebraska Act nullified the Missouri Compromise, setting the stage for the Civil War. This map also identifies various forts, rivers, fords, and an assortment of additional topographical details. Map is hand colored in pink, green, yellow and blue pastels to define state and territorial boundaries. Surrounded by Colton's typical spiral motif border. Dated and copyrighted to J. H. Colton, 1855. Published from Colton's 172 William Street Office in New York City. Issued as page no. 46 in volume 1 of Colton's 1856 Atlas of the World. Rumsey 0149.051 (1856 edition). Phillips (Atlases) 816.